We have been hearing about upcoming Samsung galaxy Note 3 Neo for the last couple of days. But I am really shocked to learn that they decide to launch another Neo in China with 2 years old Galaxy S III outfits. Its exact name is Galaxy S III Neo+ and yes dual-SIM card is inside. Design? Same as Galaxy S III obviously! The S3 Neo+ has a 4.8" Super AMOLED 720p display, just like the original Galaxy S III. Inside there is a 1.4GHz quad-core CPU of unknown architecture – possibly Exynos 4 Quad 4412 with four Cortex-A9 cores, but it could also be a Snapdragon 400 with Cortex-A7 processor. It's joined by 1GB of RAM and 8GB of internal memory, which is expandable via the microSD card slot that's on board. The battery cover is removable as well and reveals the dual SIM card slots (3G + GSM) and the 2100mAh battery. The Samsung Galaxy S3 Neo+ weighs 132 grams and measures 136.6 x 70.6 x 8.6mm - exactly the same as the Galaxy S III. At the back, there's an 8MP camera with LED flash capable of recording 1080p video. The Galaxy S3 Neo+ supports WCDMA networks bands include 850/900/1900/2100 MHz, while on GSM, they're 850/900/1800/1900 MHz. The dual-SIM capabilities of the set include dual-standby and there's a neat manager available inside Android 4.3 Jelly Bean that handles the switching between the two. Pricing and availability aren't detailed at this point. 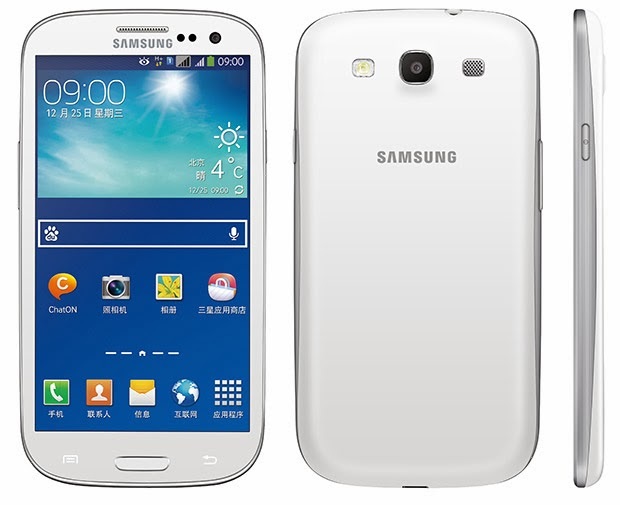 We suspect the Galaxy S3 Neo+ will make an appearance in Chinese retail stores as well as major carriers pretty soon.